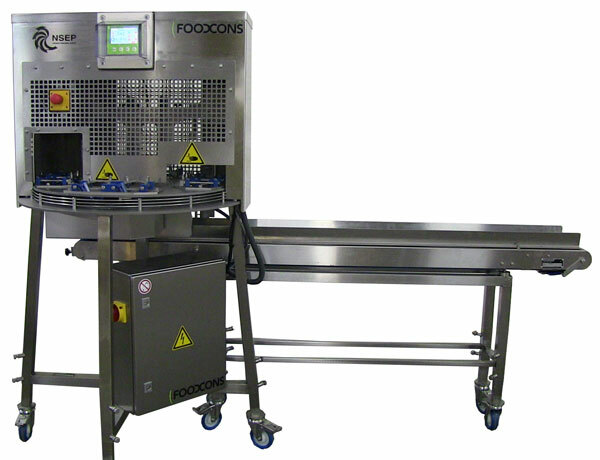 The F3000 is a semi automatic cutting system for both fruits and vegetables. Two products are cut with each stroke. The products are placed into position in a rotary indexing table, which automatically indexes to the next cutting position. The product is gently pushed through the blade set and is collected on a discharge conveyor. 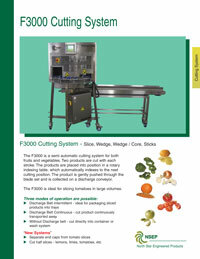 The F3000 is ideal for slicing tomatoes in large volumes. Cut half slices - lemons, limes, tomatoes, etc. 3/16" to 1-3/16: thick max product dia 3-1/4"
2, 4, 6, 8, 10, 12 Sections max product diameter 4-1/3"